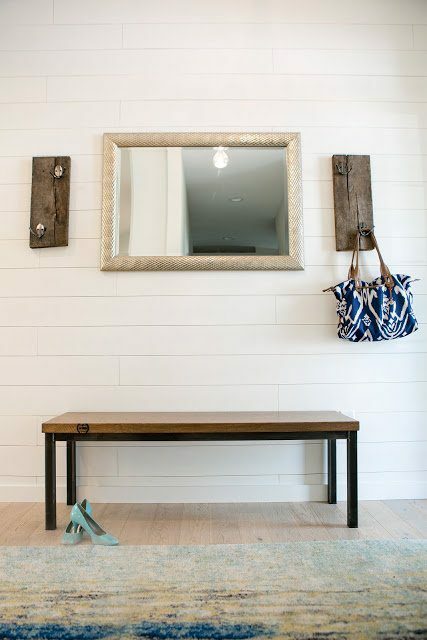 Part II: SHIPLAP, BARN WOOD and beams…OH MY! 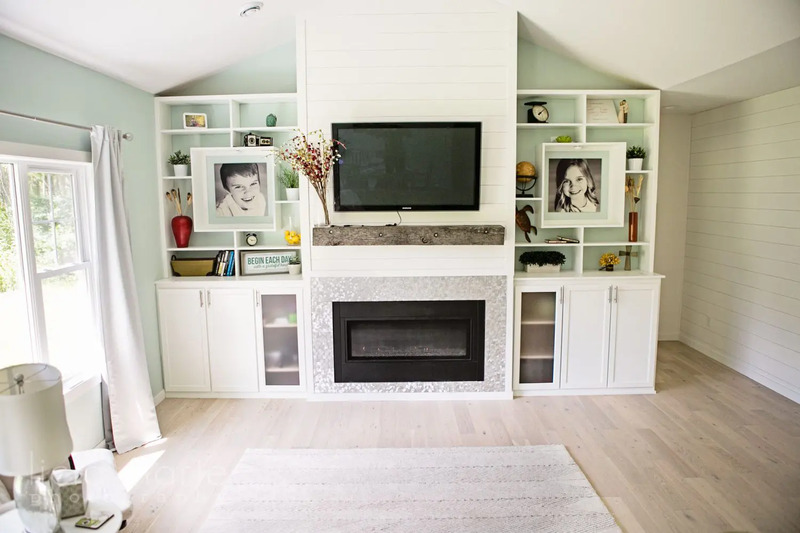 I’m so excited to have my friend, Alicia Bertram of Berties Build on a Budget, guest posting today to share Part II: Our DIY Fixer Upper Reveal – her family’s incredible story of building their dream house, and turning it into a custom home using creativity, inexpensive resources, and lots of elbow grease. 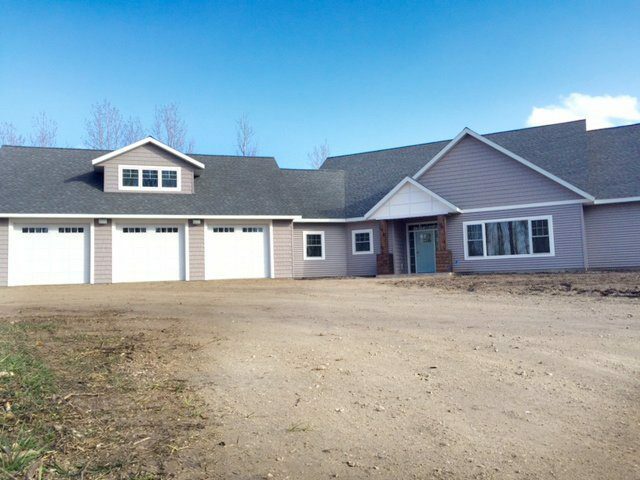 To hear how they built their own home, and the crazy sacrifices they made to get out of consumer debt while they did it, please hop over to read Part I of their story! Last week, I shared how our family built our own home, nail by nail, all while making some incredible sacrifices to get out of consumer debt. This week, I’m excited to share with you the pretty part of our journey – that is, our DIY Fixer Upper reveal! Pinterest is a girl’s best friend. Am I right!? I knew I wanted to put special touches in most of the rooms but also knew I had to keep our budget in mind at all times. The most important thing I could do in the planning of our house was to first decide how I wanted the house to FEEL. Our last house was dark, choppy but cozy. The dream I had for this space was bright, open and airy. A space that you walk in and just take a deep breath. 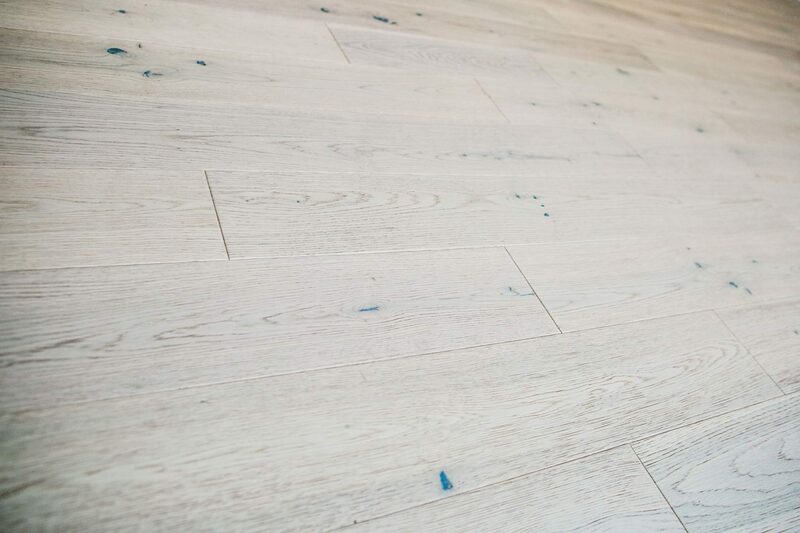 Cool tones, light wood floors, clean crisp lines and simple. Entryway: Summer of 2015 we went out to my parents farm where we pulled approximately 500 square feet of barn wood off the barn. It now covers the ceiling of our exterior entryway and also our range hood. We also turned an inexpensive antiqued decoration into a light fixture! Decoration: Purchased 5 years ago and I think it was $10 on sale! Beam: We also took a beam from the barn that serves 2 different purposes in our home. First it is an accent to our entry hooks. Mantel: Secondly, it became our fireplace mantel! Not gonna lie, this is one of my favorites! 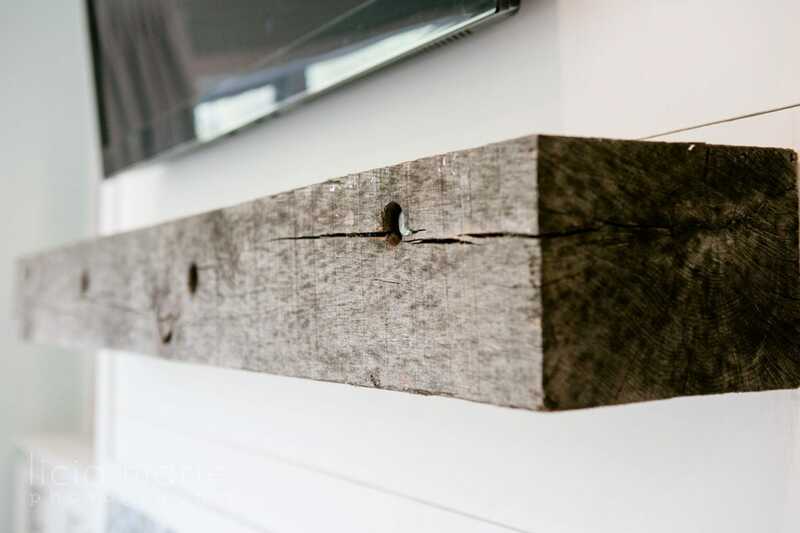 4 bolts support the beam which adds the perfect amount of rustic into the space. Hood: We continued the barn wood in the house as well. We had originally planned to use it around the island however, because it was so fragile, we decided to use it to cover up the ugly range hood we purchased. Countertops: Before I leave the kitchen space I have to talk about my countertops. 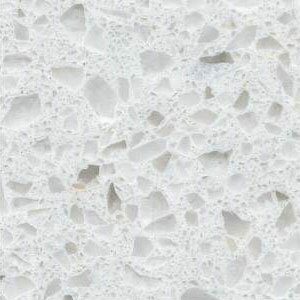 At the beginning of the process I was dead set on Vetrazzo Recycled Glass Countertops…obsessed! You see, I’m not a marble or a granite kinda person. There is something about the glass inside the stone that makes my heart flutter! However, it was one of the last things to go in the house, and because we had gone WAY over on our budget for the well, I was forced to improvise. After working with the countertop specialist at Custom Stone Interiors, we concluded I could use a remanent and a half slab of Cotton Handstone that has flecks of glass and mirror in it. Not gonna lie – I’m in love! We were also able to save $500 by installing it ourselves! And as for the island, the credit goes to Jeremy our cabinet guy! He let me help with it and gave me a hefty discount. 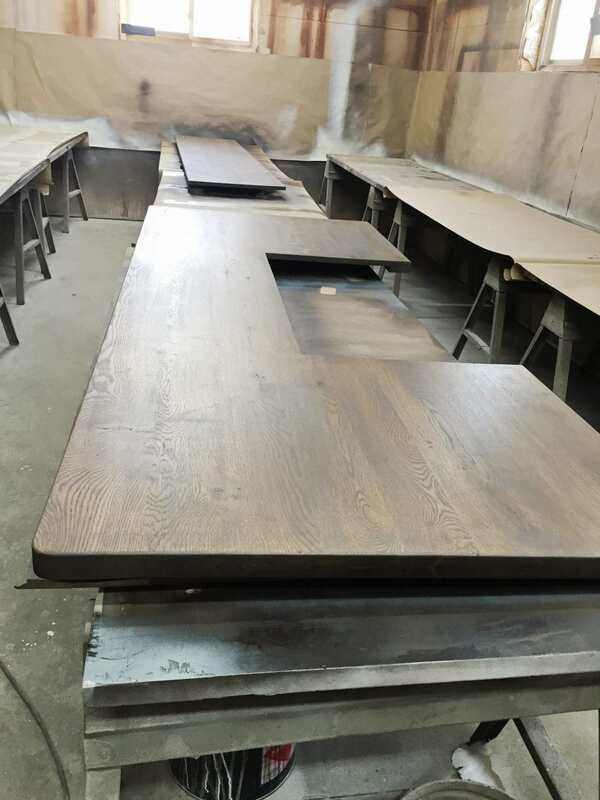 It’s made of oak (the same as the floor) and stained with 2 different colors (one dark brown and one gray). Family Room: The family room is all about the family of course, so I wanted it to be cozy, fun and family friendly. I knew I wanted custom shelving on each side of the fireplace but wanted it to be a little more unique than most shelving systems. And this is what I came up with. 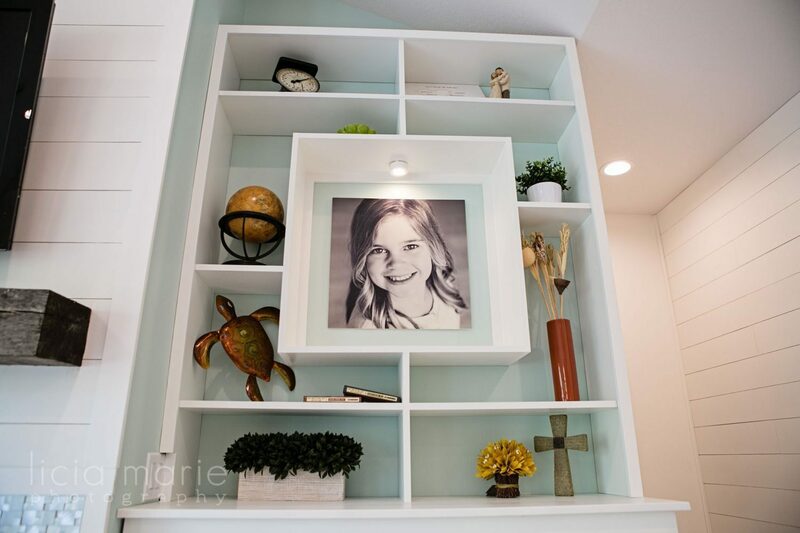 The center square has puck lights to feature the kiddos pics and the shelves allow for all sorts of creativity (p.s. Decorating is not my strong suit – most is what I had laying around and the rest was a quick trip to IKEA). The shelving cost me about $50 and my cabinet guy helped me cut them down – WHAT A GUY! I will be doing something different with the frosted glass cabinet doors this spring but the remote wouldn’t feed through the wood so we went with glass. Another way to make the family room cozy was the gas fireplace. Sleek and modern but still serves the purpose. It is surrounded by a fun stainless steel tile that came in 12/12 sheets. 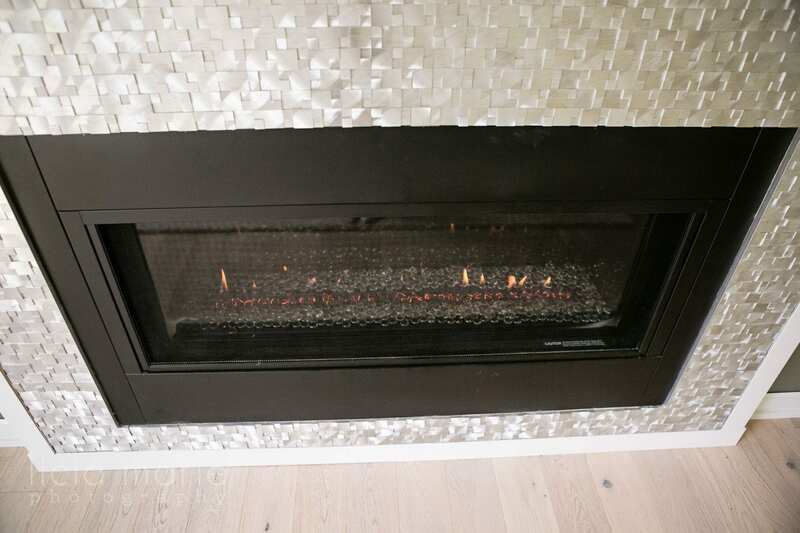 Let’s just say the shape of the fireplace and the shape of the tiles didn’t quite line up so when we went to cut the tile, it was NOT an easy project. This is where, as my dad would put it, the “BEST TOOL EVER” comes in handy! Bathroom: While we could have purchased a regular vanity for around $500+ we decided to restore an old dresser into a vanity. 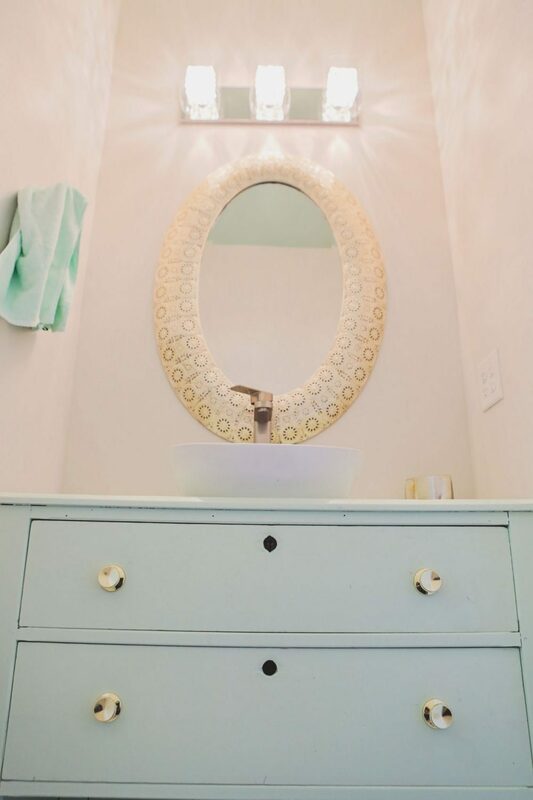 Cut out the circle and drawers for piping, add new hardware, give it a fresh coat of paint ,and you have a vanity! One more added feature is that I painted the ceiling in this bathroom as well. 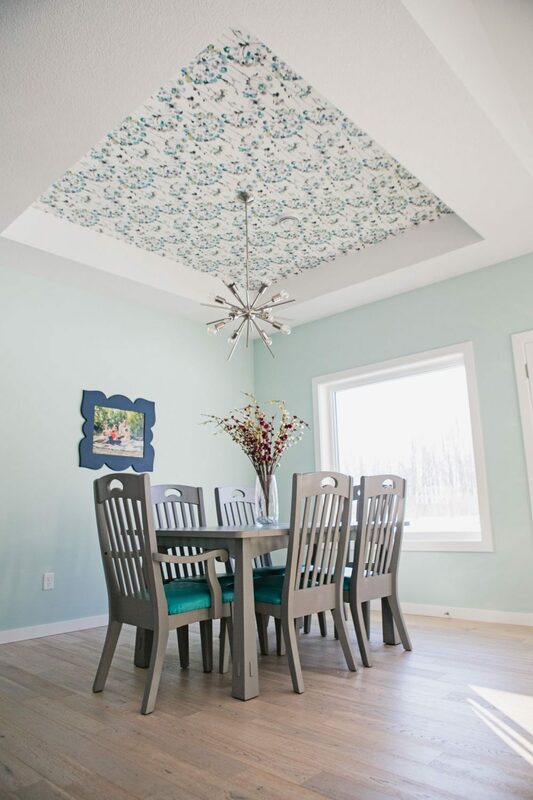 Dining Room: Speaking of ceilings, they say the ceiling is your 5th wall so use it and have fun with it! So we did! 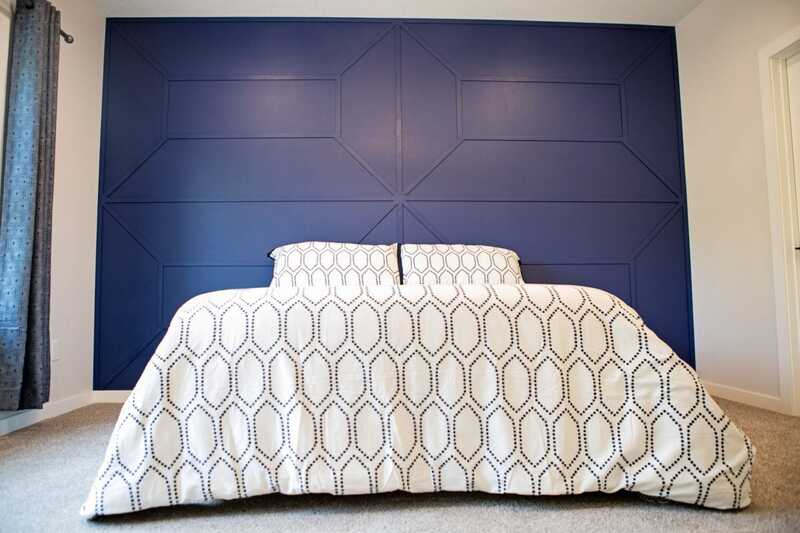 Sure, wallpaper can be used for walls, but did you know it can also create the perfect accent in a raised ceiling? No? Neither did Mr. Bertie. Let’s just say he wasn’t too happy with this project. I found the perfect pattern and color palette to go with the rest of the great room. All it took was us learning how to wallpaper. FYI and for your own good, learn what “booking” is. Don’t try to skip that step because you think you know better…because you don’t. Also, keep in mind when measuring and following the pattern, you may need more wallpaper than you think. This ceiling took 2 double rolls and left me with quite a bit extra. Don’t cringe when you see the cost…I know I did, but I will say it was completely worth it. I am obsessed with it and it’s usually one of the first things people notice. 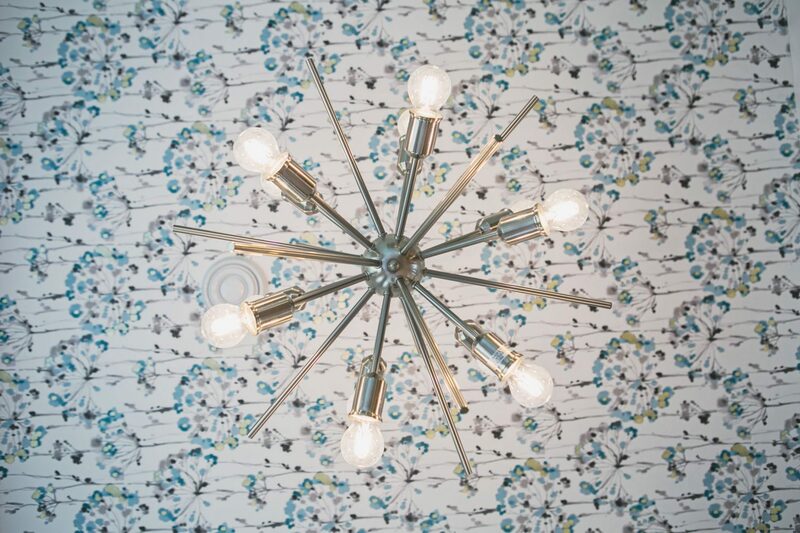 Oh, and what better way to accent the accented wallpaper but with a light fixture that plays off the pattern?! Bedroom: When I found this image on Pinterest I knew I wanted it for our bedroom. 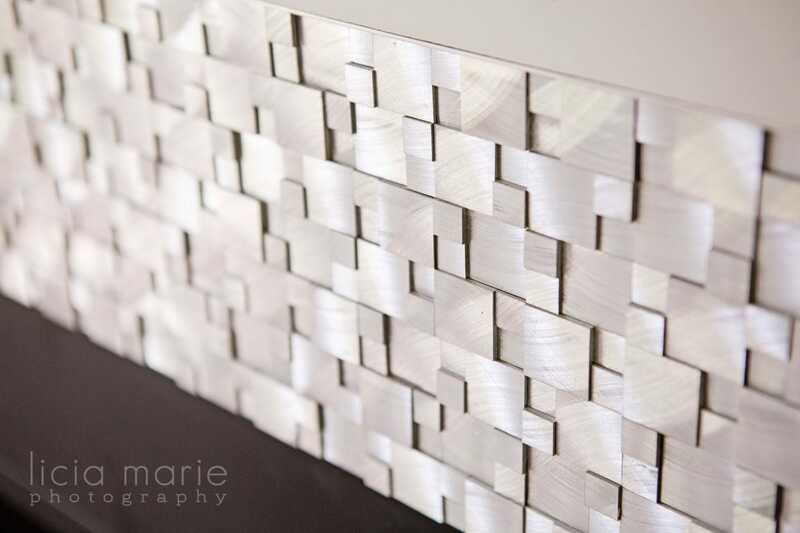 It was the perfect accent wall and use of creativity with a simple lathe. We also made the light fixture out of 2 different fixtures to meet my design. Is anyone else obsessed with Einstein bulbs?? Flooring: I know people love their dark hardwood floors, but let’s be honest people, how often are you finding yourself hitting your head against the wall because the floor is dirty AGAIN! Light floors are the bomb! 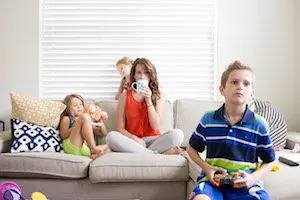 You can have a ton of traffic throughout the house and you will hardly notice it. I’m not saying I don’t clean my floors, I’m just saying as a mom of 2 kiddos I’d rather be running around with them then on my knees scrubbing the floor. My big WANT here was wide plank light engineered flooring throughout the main living area and into my studio. But my budget NEED was to keep it reasonable. I ended up going with a 5” White Oak that has a pickled finish. Again, if you go back to my original feel of the house I wanted it to be bright, airy and almost beach like. What better way than to have a sand toned floor? 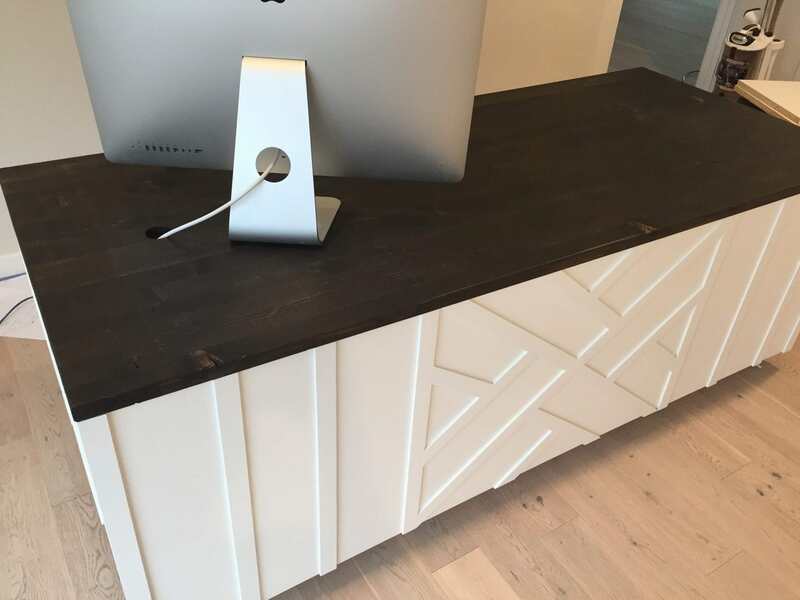 With the help of Adam from Arnquist Flooring in Alexandria, we found the perfect fit: Elements Engineered Brushed Oak Sandstone. 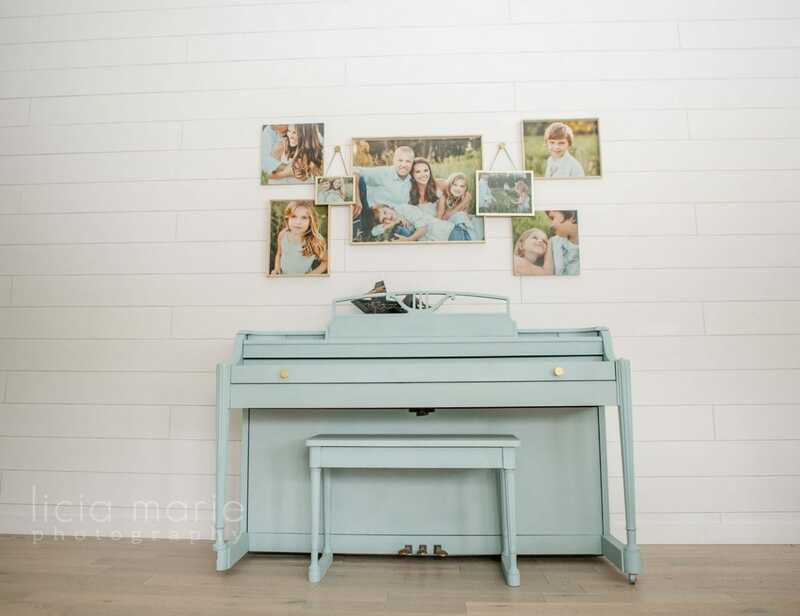 Shiplap: And what house would be complete these days without a Shiplap wall? I was on a tight budget here as we were nearing the end of our house. 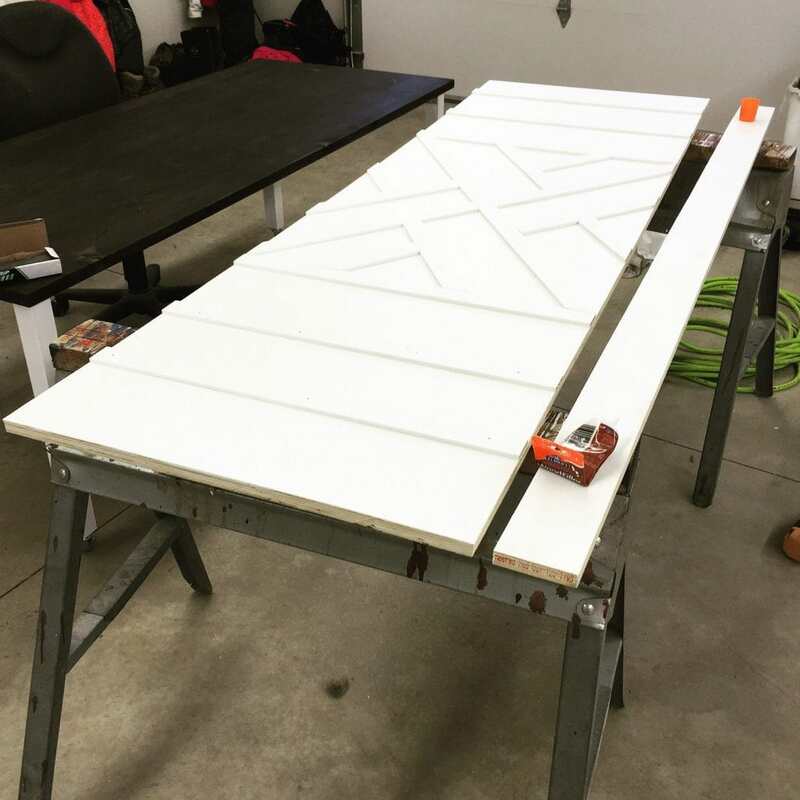 While I could have spent $650 on tongue and groove boards, I went the more budget friendly route with underlayment, which I posted all about here. Again, it is one of my favorite features of the house. Simple but clean. Shiplap: $191.44 underlayment, paint and trim. This experience was so empowering and has completely changed my mind set. For example, after the house was complete and we’d moved in, I needed a new desk for my studio. I couldn’t find anything I liked within my budget, so I decided to make my own! Because…I do that now. I like it so much more than anything on the market, and of course the style fits perfectly in our home. Moving forward, there is still much more work to be done! 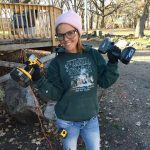 I hope you’ll follow me as we tackle more DIY projects on our new home. Next step: a concrete slab, sidewalk and lots of landscaping! Before you do anything, decide how you want your house to feel. 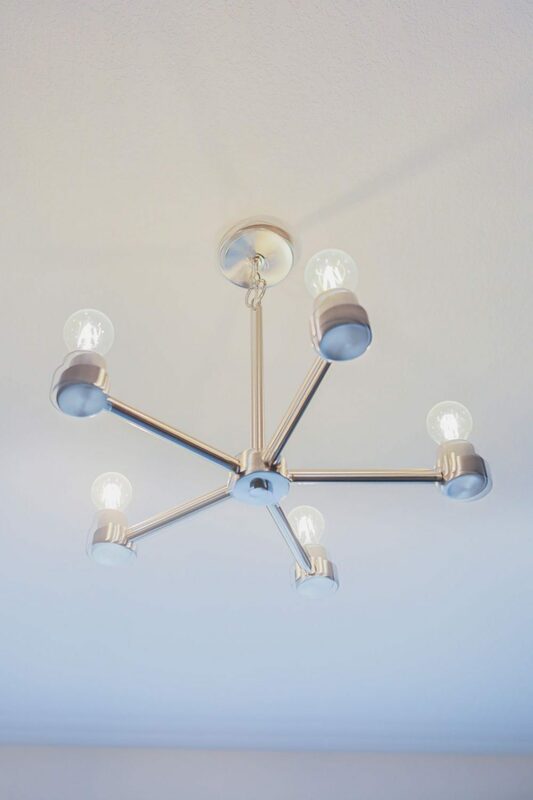 Explore – use the power of Pinterest and find 5 things that inspire you to make your space unique. Alicia Bertram is a dreamer and photographer who blogs at Berties Build On a Budget. Please visit her blog for more images of her beautiful home, details on her budget, and home building DIYs! We tore down an old barn my husband great grandfather built. We saved tons of stuff. Used the old beams to make stairs and put on the ceiling in our front room and kitchen. Love the look. 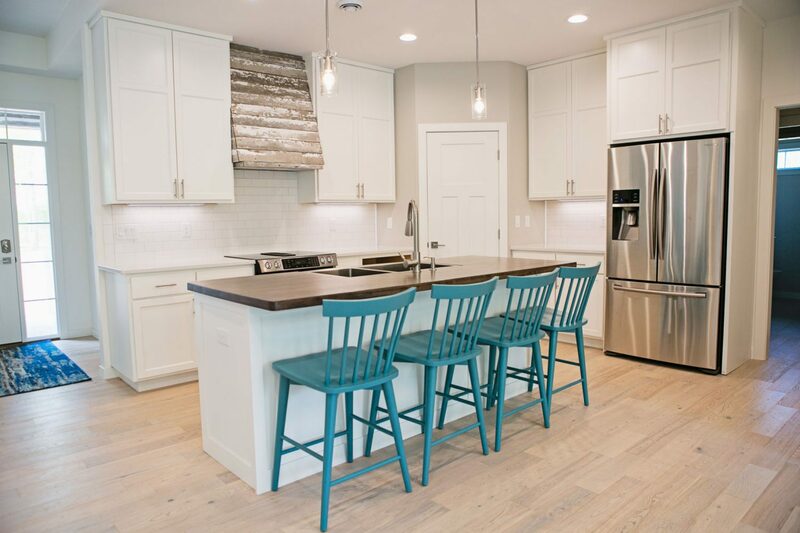 What a beautiful renovation! The wallpaper on the ceiling is my favorite part, how imnovative. I’ve always wanted a countertop with glass pieces in it! And shiplap, who doesn’t love shiplap. Your whole place looks gorgeous! I love your home decor! 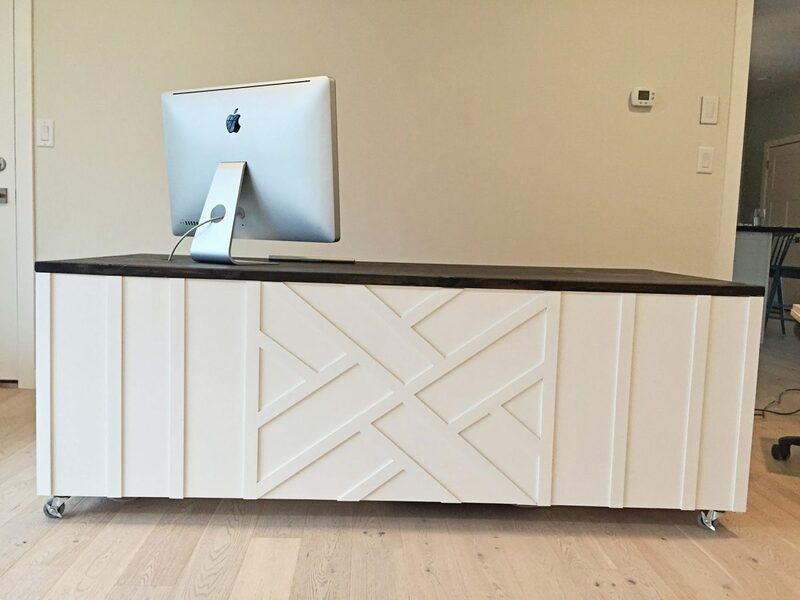 The wood accents are rustic yet so clean and elegant! It looks amazing! I’m looking to add a little bit of a farmhouse to my new home. Everything you did is lovely! I love your studio desk too! Thanks for sharing this transformation. 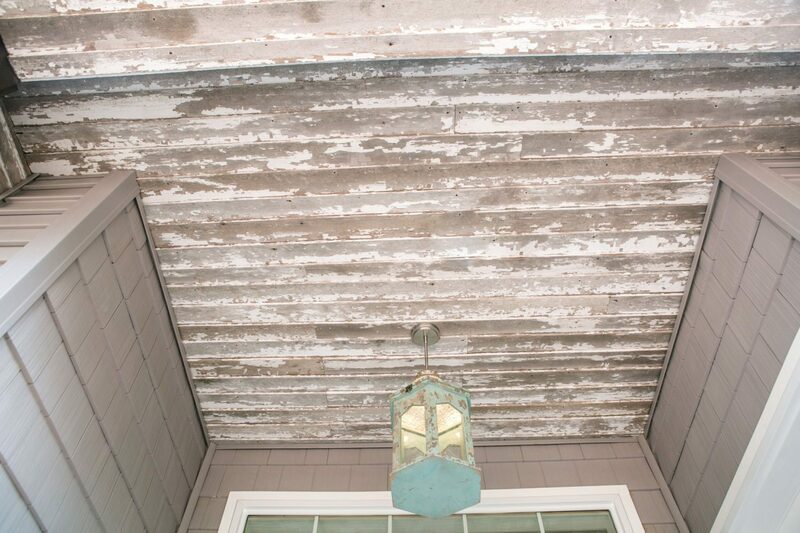 We are looking to buy a fixer upper, and your ideas are so inspiring! Wow!!!! Your home is stunning! So many unique and interesting ideas. 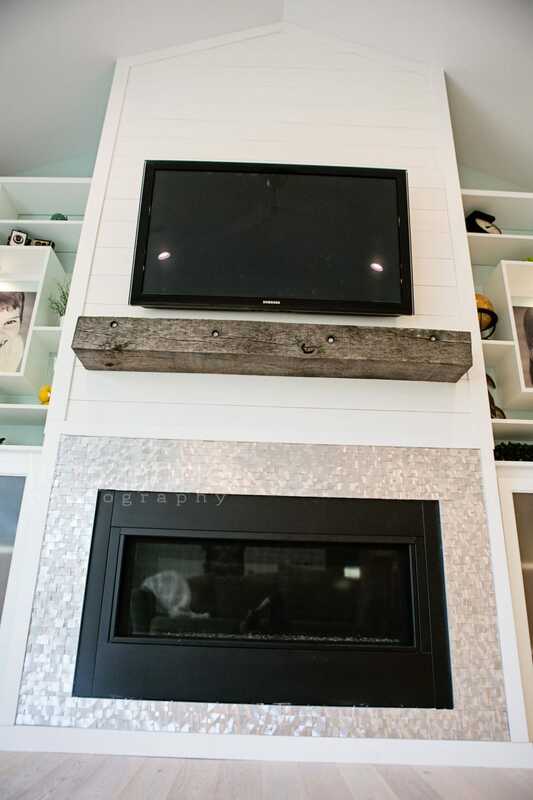 I love that you were able to incorporate barnwood from your parent’s property. Hey any chance you can tell me where you got your bedding from? Hi Sarah – Alicia got it at Target last spring.